Who does not like a quick and flavoursome meal? 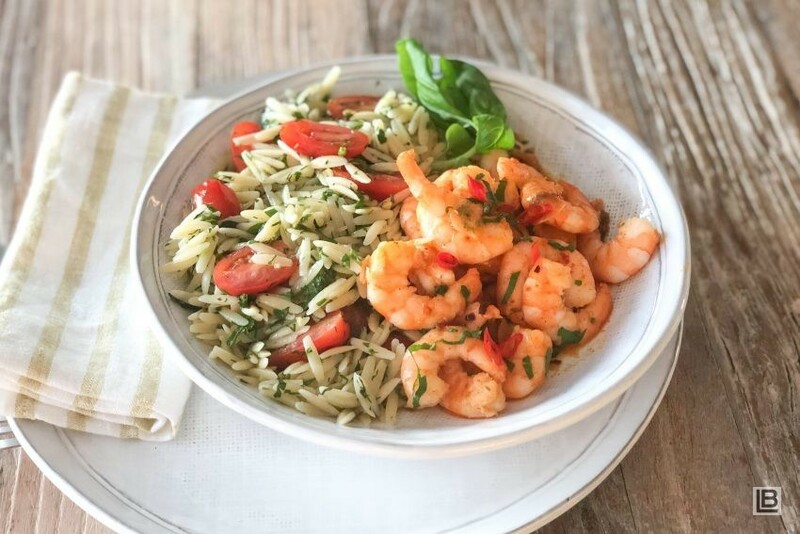 This spicy prawn and orzo (rice-shaped pasta) is super quick and doubles easily if you want to feed a few people. Like I said, it is quick and ideal for those exhausting midweek days but, this is just as good on a beautiful summers day with a glass of vino. Spice it up, spice it less …… that is entirely up to your tastebuds ….. or mood. This recipe is by Elly McCausland. First, prepare the orzo salad. Bring a large pan of salted water to the boil and cook the orzo until just al dente (around 7–8 minutes). Whilst that is cooking, mix together the olive oil, salt, herbs, lemon juice and zest. Drain the pasta, then toss with the olive oil and herb mixture. Stir through the tomatoes and set aside. For the prawns, heat the butter on a medium heat in a saucepan. Add the chillies and garlic and cook for a minute until fragrant and the garlic has softened slightly. Turn the heat up slightly, throw in the prawns and smoked paprika and cook for a couple of minutes on each side, or until just pink. Season and scatter with the parsley. Divide the orzo salad between 2 plates or bowls. Spoon the prawns and butter over the top then serve immediately.